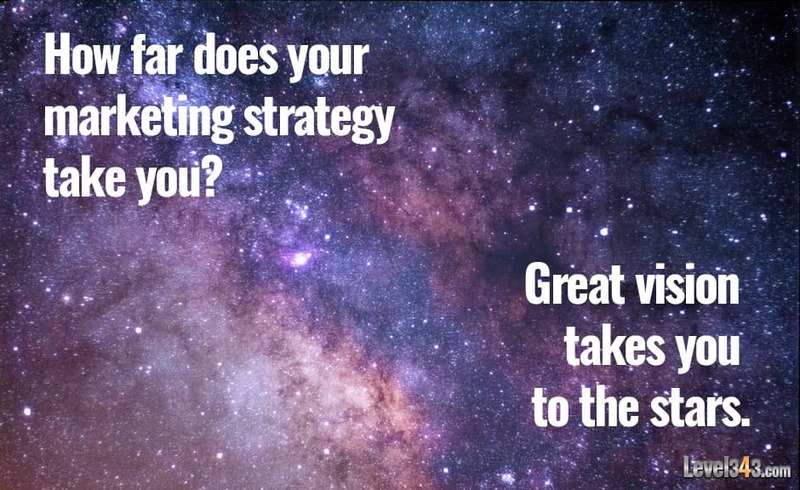 With great vision comes a stellar marketing strategy. What makes it stellar? This is what I’m going to cover today, and I hope it really gets you to thinking about the possibilities with your own marketing strategies. Vision leads to mission leads to strategy and so on. By using your ideal future (vision) as a goal and your mission as your guide, your marketing strategy will always be on point. It blends with every other marketing strategy, every other marketing goal. In the past, I’ve called this “connecting the dots.” At the end of the day, connecting the dots produces better, stronger, more long-lasting results. That’s expecting a lot from something so ethereal and futuristic, but it is possible. In my mind, it’s marketing optimized to a “t”. Having a vision involves deep thought about the future and possible outcomes. When creating the path through which all other paths lead, you have to be able to see beyond what is now. You may never actually reach the vision – remember, it’s the ideal future – but it’s your aim. So, you’re getting ready to create a marketing strategy. What does your vision look like? What is your end, idealistic future? Here’s a hint: your vision should never be “more conversions.” Why? “More conversions” is a short term goal. It doesn’t think beyond the sale. How many companies want a single sale or conversion? How many companies want to see the client just once? -And if you do happen to have one of those rare companies, how many don’t want referrals? A true vision needs to lead and keep leading. It’s the endless goal. The one that you may not reach, but you’ll always aspire to. It’s the thing that keeps you always striving for greater excellence. Your vision might be “to become a thought leader in my industry, respected by my peers.” How would your marketing strategy follow that vision? Don’t get me wrong. There’s nothing wrong with wanting conversions. Money makes the world go ‘round, as the saying goes. That can’t be the end of it. Marketing strategy: Develop methods to make buying easy, uncomplicated and without frustration. Will the above lead to more conversions? Absolutely. Is that the end goal? No. The end goal, the vision, is to create a great customer experience. “Strategic implementation,” or the implementation of your marketing strategy, can go off course at times. Sometimes the fireball that sent you and your marketing team barreling toward the goal turns into a tiny puff of smoke six months into a year-long campaign. Believe it or not, a great vision can stop that from happening. If you keep your vision in mind when creating your marketing strategy, it will be a constant reminder as you move forward. Three, six, nine months down the road, you aren’t just running a campaign. No. You’re working to create a great customer experience with every sale. It’s not just lip service. It’s powerful. Company visions have become mantras. 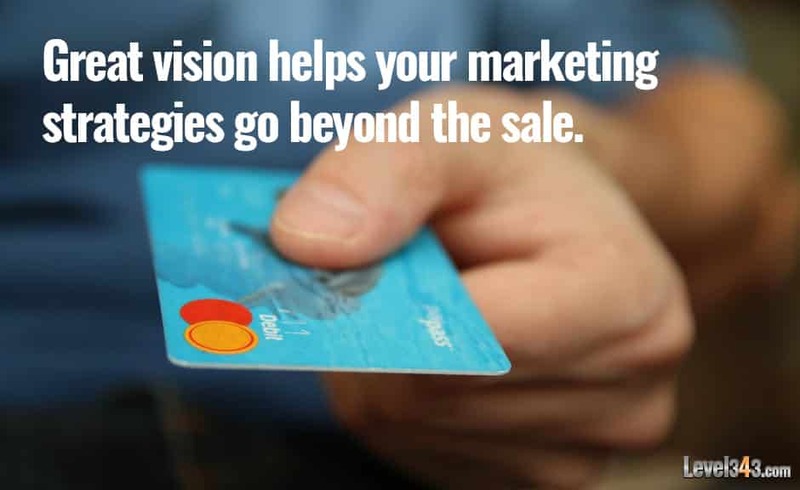 Now, you can build a marketing strategy without vision. You can. Thousands have done it. Will it be as successful as it can be? I don’t think so. Without vision, you’re putting your all into an endeavor and getting half back. Reassess your marketing strategies of the past. Where did you lose unity? At what part of the implementation did you start to lose steam? Did you lose customers because you focused on the sale instead of them? The next time you start thinking about marketing, let great vision be your guide. Strive for excellence and a truly stellar marketing strategy.